We live in a world where we are constantly looking for the “new thing” to better our health. The new super food, the new drink, the new gadget. This isn’t a bad thing per se, but sometimes this thinking leads to overlooking things that are good for your health but that have been around for a long time…like ginger turmeric tea. Both ginger and turmeric have great nutritional value. Today we’ll talk about the nutritional value of ginger turmeric tea, the benefits of ginger turmeric tea, and even how to make it in your own home. This tea may be very old in its origins, but it could still be that something “new” you’re looking to add to your diet regime. Ginger is a flowering plant that goes by the Latin name Zingiber officinale. The spice that we all know—and many of us love—comes from the rhizome (underground stem) of this plant. It originally grew in tropical rainforests in southern Asia, but was brought to Europe in the first century AD via the India spice trade. Now it’s used throughout the world as a fragrant and flavorful spice in food and as a herbal remedy. You can purchase the fresh ginger rhizome, often called gingerroot, at most grocery stores. You can also buy dried gingerroot, powdered ginger, pickled ginger (the kind that comes with your sushi order), and crystallized or candied ginger. Turmeric, or Curcuma longa, is a leafy, perennial plant that’s actually a member of the ginger family. It southern Asia, where it grows wild in the forests still and thrives on the heavy rainfall of the region. Though some cuisines do use the plant’s leaves to flavor food, it’s the rhizomes that provide the spice we know as turmeric. Due to its deep orange-gold color, turmeric is used in many cuisines—such as Indian, Pakistani, Bangladeshi, Iranian, and Vietnamese—not only for its powerful flavor but also for its visual impact. Turmeric is also a valued herbal remedy, especially in Thai folk medicine and in Ayurveda, a traditional form of medicine rooted in India. You might be able to find the fresh or dried turmeric rhizome in some specialty stores, but the powdered form is the most common. While there is obviously a lot of nutritional value to both ginger and turmeric, the big story here is the amount of manganese. Combining a tablespoon of each spice into a tea would give you nearly an entire day’s worth. Together, ginger and turmeric are also a good supply of iron for your daily diet. But really, what do all these ginger turmeric tea nutrition numbers mean? What are ginger turmeric tea’s benefits? As we noted, there is a very large amount of manganese in the concoction. Manganese is an essential mineral for the body, involved in bone, cholesterol, carbohydrate, and protein production and skin integrity (it helps protect skin from the damage of ultra violet light and oxygen related damage). Ginger turmeric tea is also a good source of your daily requirement of iron. Iron is essential for helping blood transport oxygen through the body. Iron also helps keep your skin, nails, and hair healthy. Ginger turmeric tea is considered excellent as an anti-inflammatory beverage. Many cultures around the world use ginger and/or turmeric as a general anti-inflammatory for the joints and muscles. The tea may also help deal with the inflammation caused by arthritis. In multiple studies, turmeric (or, more specifically, its main ingredient curcumin) has been found to prevent general joint inflammation, treat pain and improve function in knee osteoarthritis, and reduce joint pain and swelling related to rheumatoid arthritis. Ginger seems to act in a similar way to COX-2 inhibitors (a non-steroidal anti-inflammatory drug) and ibuprofen when it comes to inflammation. A 2012 study using ginger extract showed that the herb treated inflammation in rheumatoid arthritis patients as well as steroids did. Ginger has also been shown to be effective for the pain of hip and knee osteoarthritis. Ginger turmeric tea may also be of use to help lower blood sugar. A study in China has shown that curcumin, which is found in turmeric, may help to stimulate insulin production and improve the body’s sensitivity to insulin. These qualities are very beneficial for people who suffer from diabetes. According to The British Journal of Cancer, researchers at the Forest Research Institute of Malaysia have found evidence that ginger and turmeric can help inhibit cancer and tumor growth. Ginger turmeric tea is filled with a number of compounds (including vallinoids, zingerone, shogaols, gingerols, and paradols) that could help defend against cancer, according to researchers at the Industrial Toxicology Research Centre in India. According to scientists at the University of Michigan, there is also some evidence that ginger may help specifically with ovarian cancer. It should be noted that ginger, turmeric, or their ingredients are not considered a potential cure for cancer; they just may help in prevention and curbing further growth of cancer cells. There is some research that points to turmeric being good for your brain in the fight against Alzheimer’s disease. The chemical makeup of turmeric may inhibit the accumulation of beta-amyloids, which are the main component of the amyloid plaques that do damage to the brain of an Alzheimer’s patient. Ginger turmeric tea is also very good for your stomach. The tea is excellent for general digestive help, as ginger can help the muscles in your stomach relax and ease digestion. Ginger and turmeric can also help settle an upset stomach and relieve nausea and vomiting. Researchers at the University of Maryland Medical Center have noted that the curcumin within turmeric may also stimulate bile production in the gall bladder, which can aid in digestion. These are just some of the many benefits. Note that ginger turmeric tea for weight loss is a current idea floating around that seems to be gaining steam in some circles, but there is currently not very much in the way of scientific research to back it up. 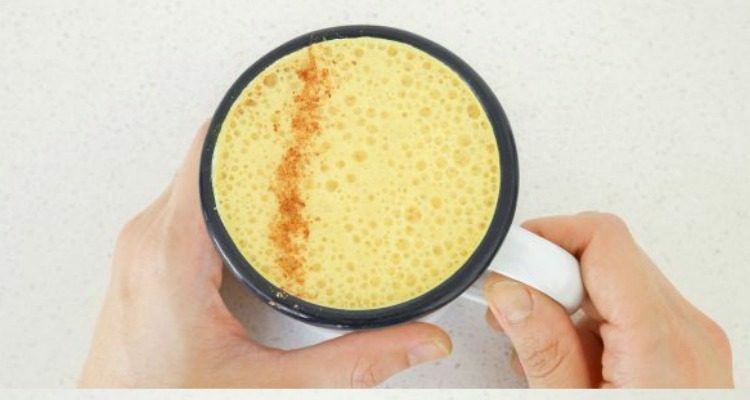 Now that you see the health benefits of ginger turmeric tea, the next thing to learn is how you can make ginger turmeric tea in the comfort of your own home, so you don’t have to buy pricey blends at the store. Heat the water to a boil and slowly stir in the turmeric and ginger. Reduce heat to medium-low and simmer for 10 minutes. Sweeten to taste with honey or stevia. In a blender, pour 2 cups of boiling water. Add the turmeric, ginger, and cinnamon, and blend everything together. You can then add the coconut oil /butter and honey to your desired taste. Heat the almond milk to the point where it’s hot, but not boiling (stir regularly as you’re heating it). In a separate container, mix the spices. Pour a small amount of the heated milk into the spice mixture (just enough to combine the dry ingredients) and stir; make sure there are no lumps. When the consistency is smooth, pour in the rest of the heated almond milk and stir. Serve immediately. These are just a few of the simple recipes to make ginger turmeric tea at home, but once you start with the basics, you can get creative and make your own variations on the idea. Just keep in mind your health and diet goals when selecting or devising a tea recipe. “Optimized turmeric extract reduces β-Amyloid and phosphorylated Tau protein burden in Alzheimer’s transgenic mice,” National Center for Biotechnology Information, https://www.ncbi.nlm.nih.gov/pubmed/21875408, last accessed Mar 6, 2017. “Turmeric Compound Boosts Regeneration of Brain Stem Cells, and More,” Mercola, October 13, 2014; http://articles.mercola.com/sites/articles/archive/2014/10/13/turmeric-curcumin.aspx. “Turmeric, the Golden Spice,” National Center for Biotechnology Information, https://www.ncbi.nlm.nih.gov/pubmed/21875408, last accessed Mar 6, 2017. Na, L.X., et al., “Curcuminoids Target Decreasing Serum Adipocyte-fatty Acid Binding Protein Levels in Their Glucose-lowering Effect in Patients with Type 2 Diabetes,” U.S. National Library of Medicine, November 27, 2014; https://www.ncbi.nlm.nih.gov/pubmed/25374024, last accessed February 22, 2017.